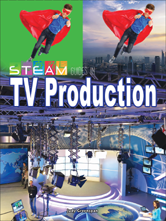 This book gives insights into the processes involved in creating and broadcasting television shows, and explains how each STEAM field is involved. The Magic of Science? Or the Science of Magic? Television and Ducks. That's Right. Ducks!